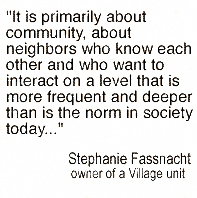 Cohousing fosters a community atmosphere through shared management and decision making. Appeared in the Wisconsin State Journal on November 7, 1999. As the completion of Madison's second cohousing development draws near, Sue and Art Lloyd are living their dream of creating a project where work and decision making are shared by residents, and young families mingle with retirees on a daily basis. 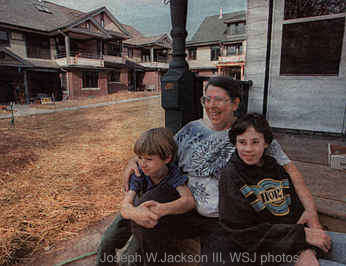 Above: Celia Stephenson and her children, Peter, 6 and Tanya, 10, watch the progress around them as the Village Cohousing Community takes shape. Located at the corner of Mound and South Mills streets, the newly developed Village Cohousing Community appears similar to other condominium projects from the outside. But inside, something different is happening. While residents own their condominiums, there is a large common area with a kitchen, fireplace, laundry room, two guest rooms and a play area. The development includes 13 new apartment-style condominiums, two new townhouses, and older single-family home and a second older house divided into two flats. Units range in size from a 700-square-foot, one bedroom unit to a 1,600-square-foot, two bedroom townhouse with a loft. "It's a little bit small for people with children. But there is so much common area, both indoors and outdoors, that can be used by everybody on a daily basis, that you can live in a smaller unit than you might ordinarily, " said sue Lloyd, who with her husband, Art developed the $3 million project. Originating in Denmark in the 1970's and introduced in the United States in 1988, the cohousing concept aims to create a cooperative form of housing that accommodates changing families and lifestyles and provides a balance between personal privacy and cooperative living. "We're not just selling condominium units to anybody who walks in off the street who wants to come into this place with its great location," said Art, a retired Episcopal minister. "People have to belong to the cohousing community." 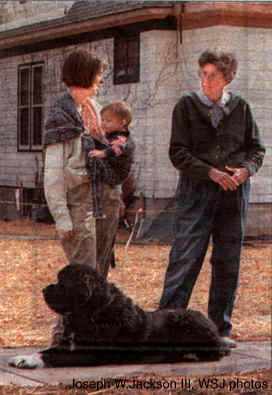 Above: Residents Amy Roundtree, holding her daughter, 11-month-old Helen Murphy, talks with Sue Lloyd in the development's courtyard. At Roundtree's feet is Middy, a 9-year-old Newfoundland. Belonging to the community entails participating in the management of the property, serving on committees and sharing responsibilities pertaining to maintenance, bookkeeping, gardening and cooking common meals, which are shared from one to five times a week. "It is primarily about community, about neighbors who know each other and who want to interact on a level that is more frequent and deeper than is the norm in society today and who agree to manage the place that they're living in," said Stephanie Fassnacht, and owner of one of the Village units. The Lloyd's discovered the cohousing concept in 1991 at a seminar sponsored by the Design Coalition. "Over 100 people attended and out of that came four groups that sort of shifted down to two groups and we were one of them," said Art. The Fair Oaks Cohousing Community on Dawes Street is the only other cohousing project in Madison, said Sue. "We became active in 1993 and spent a tremendous amount of time linking at sites and we went through the process of trying to decide what sort of space we would like and what we would like to see in it. We decided we would like to be within a 2-mile radius of Downtown," said Art. Residents of the village believe interacting with people of all ages in a community setting is especially beneficial for children. "We do believe that it takes a village to raise a child and a child in the U.S., in this day and age, is not best suited growing up in the isolation that we have in some of the living situations in our suburbs or apartments." said Sue. Designed in the Prairie style, primarily by Lou Host-Jablonski of the Design Coalition, and built by Krupp Construction, three two-story buildings and two older homes form a U-shape around a central courtyard. There is a gradient from most public to most private, so for example, the kitchens face the common areas and that's the most public space, so people working in their kitchens can look out on the common areas and see their," said Fassnacht. Each unit is designed with a different floor plan and prices range from $85,000 to $180,000. So far, 17 of the 18 units are sold or rented. Of the buyers, two families have young children, said Art. common house. But the conclusion was that we would not end up with the kind of housing units that would work well for a cohousing community," said Sue. Renovating the existing structures would have also been more costly. "A major consideration was the economics. We would get fewer units and renovating existing housing does cost more than building new," said Art. In addition to the common areas, the community includes room for gardens, a recreational and exercise room, outdoor pedestrian areas, nine garage parking spaces and open-lot parking spaces at the back of the building. "So the central area is a place where people can interact or kids can play," said Art.